that human life may not be the only life in your home! 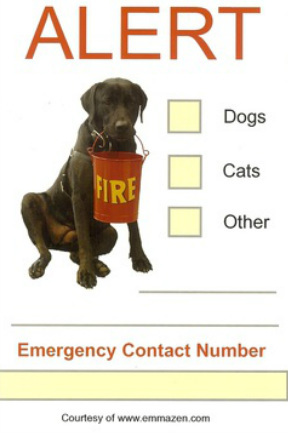 Alert Stickers are your first line of defense in notifying first responders that you have pets in your home! Place these early warning signs on your doors and/or front windows. Send us $1.00 (one dollar) per sticker along with a full size self-address and stamped envelope to: The Emma Zen Foundation P.O. Box 25414 Anaheim, CA 92825 and we will mail you an alert sticker for your home. We also suggest knowing your pets "Comfort Zone." ™ A comfort zone is that place your pet runs to when it is really scared to death! So grab a neighbor if you don't want to do it and come in banging cans or rattling sacks anything to scare the bejebers out of your pet, paying attention to where your pet runs and hides. This is their "comfort zone", now you are armed with more information and if fire fighters are to enter your house you could say "we have a cat and she is probably under the desk in the office." your pet to react on their own during an emergency situation. Training tips made for effective canine self preservation!